This hospital mattress replacement is an incredible value for a full, 3 layered pressure redistribution foam mattress. True memory foam heel section reduces pressure at painful contact points. This mattress overlay combines an intelligently engineered die-cut top layer, and full length articulation cuts on the bottom layer for optimal pressure relief. Ideal for long term care this pressure relief mattress replaces your standard inner spring hospital mattress. Perfect for home health care to reduce pressure and prevent bed sores. Fits over stand medical bed frame. 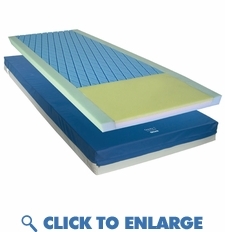 This pressure reduction mattress also available with raised edges for additional patient protection. This hospital mattress replacement is an incredible value for a full, 3 layered pressure redistribution foam mattress. True memory foam heel section reduces pressure at painful contact points. This mattress overlay combines an intelligently engineered die-cut top layer, and full length articulation cuts on the bottom layer for optimal pressure relief. Multi-layered, high density foam provides optimal pressure redistribution. The ultra soft heel section is uniquely designed to provide extremely low skin interface pressure. The mattress cover is a 2-way stretch, water resistant, vapor permeable nylon. The cover provides a low moisture transmission rate (MVT) which keeps the patient cool and dry. Optional firm side rails help the patient transfer in and out of bed minimizing the risk of falling.